A few years ago, the farm-share trend took off in NYC. A farm-share, or CSA (community supported agriculture) is essentially a license to receive fresh produce from a local farm on a weekly basis. It’s a fantastic way to get the freshest in season organic produce delivered to your door. Some people get intimidated by the fact that you have no idea what’s showing up until your doorbell rings. For others, it’s their favorite weekly challenge. I fall into the others category. This is a tale of CSA invention. complimenting or highlighting the others. Juicy tomatoes blistering in the heat of olive oil and bursting to create a light sauce. Spinach wilting to add a hint of earthiness, enhanced by Italian seasoning. Goat cheese melting to add richness and creaminess, and a hint of background spice to cut the richness. 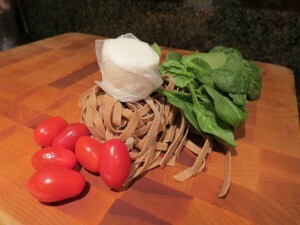 And whole wheat fettuccine to tie it all together.